A shorter version of this article was first published in edible Monterey Bay magazine, Winter 2014. In the past 24 years I have seen the California’s Central Coast food scene grow from a sorry corner of the produce section to entire markets featuring locally grown, sustainable products. When Joe and I first started marketing grassfed beef in 1991 people wrinkled their noses and asked “What’s grassfed beef?” Today, it’s a common choice on menus and in butcher cases everywhere. Locally raised, grassfed meats have even been parodied by Fred Armisen and Carrie Brownstein on Portlandia’s “Is the Chicken Local?” episode when the couple abruptly abandons a romantic dinner to go find the farm where the chicken was raised. We have gone mainstream (and can laugh at ourselves too)! One of the most common misconceptions about meat is that it’s an ecological disaster. Red meats, and cattle more specifically, are blamed for clear cutting rain forests, emitting more methane than LA freeways, using too much water, and a whole list of health risks like high cholesterol, heart attacks and cancer. What’s lost in this argument is that cattle are not the problem: land managers are. Cattle are living, breathing, gas-emitting animals just like whales, dogs, cats and yes – even humans. Managed properly, cattle are beneficial to the environment and produce a nutrient-dense, low calorie food that builds muscle and fights disease. They also nurture expansive, healthy rangelands that have the potential to become the earth’s largest carbon sink. Meat itself is not bad for the environment. Humans’ poor management of the animals that produce it is. Concentrated Animal Feeding Operations (also known as CAFOs) with their sprawling waste ponds, antibiotic-tainted water runoff, and massive energy consumption strain the environment. Overgrazing leads to barren landscapes that cannot capture water or grow plants, creating a void where photosynthesis was once possible. But these conventional, industrial models are coming under more scrutiny (as the couple in Portlandia so aptly portrayed) while other land and animal management practices are celebrated as a solution to climate change. There is resurgence – a revolution, even – happening all over North America and the world focusing on alternative ways to manage cattle that restore rangelands and waterways. When managed in ways that increase biodiversity, build soil health and restore grasslands, cattle become beneficial allies for environmentalists. Meat, then, is not only good food, but also a healthy byproduct in the fight against global warming. It’s part of an growing trend toward regenerative agriculture. Richard Young, Policy Director of The Sustainable Food Trust, a UK-based think tank exploring solutions for a food production system that causes “the least possible harm to both humans and the environment” recently addressed the ‘eat less meat’ evangelists. Young farmers and ranchers around the globe are embracing a new decision-making process in land management that takes into account land, people and planet. Holistic Management, pioneered by the Zimbabwean biologist Allan Savory and described in his 2013 TED Talk “How to Fight Desertification and Reverse Climate Change,” uses grazing as a tool that addresses the most pressing environmental issues we face. We have been using Holistic Management on the ranches we manage for 24 years and can attest to the wildflowers and oak trees that thrive where our cattle have grazed. Joe and I attended our first Holistic Management class the month before our wedding and learned that by carefully planning our livestock grazing, we could maximize our ranch’s productivity. Using portable electric fences to control the timing and number of cows, we moved them often to prevent overgrazing. Careful monitoring ensured we met our goal to promote perennial grass growth and healthy soils while fattening our cattle and increasing our profits. “We can take enough carbon out of the atmosphere and safely store it in the grassland soils for thousands of years … and if we just do that on about half the world’s grasslands that I’ve shown you we can take us back to pre-industrial levels (of carbon) while feeding people. I can think of almost nothing that offers more hope for our planet, for your children, and their children and all of humanity,” Savory says. Feeding people meat. Grassfed beef provides essential nutrients, building muscle and joints, with minimal calories. Pasture-raised animal also use much less water than those raised in CAFOs. 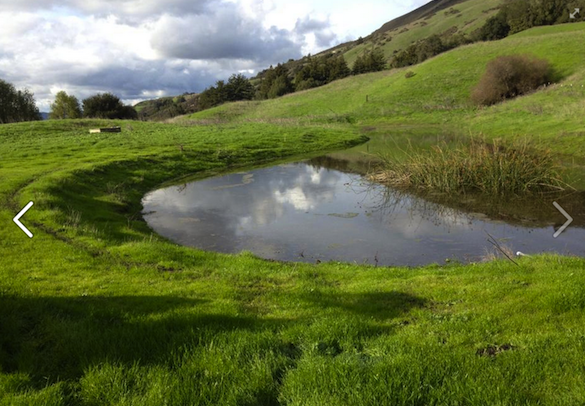 Last winter’s drought mandated that we haul water to our cattle atop a ranch we lease in Watsonville, Calif. This gave us a real-time measurement of exactly how much water each cow needed: 10 gallons a day or 3,650 gallons per year. Compare that to more intensive factory CAFOs, which use vast amounts of water, with automatic “flushing” systems that consume up to 150 gallons of water per cow, per day. (Source: http://www.sustainabletable.org/906/waste-management.) Add to that the millions of gallons of water used to grow the grain they are fed, and it’s no wonder conventional red meat gets such a bad rap. But Red Meat is Bad for Your Health! Just like any product, the quality of meat you buy depends on how it was made. Were the cattle humanely treated? Did they graze on grass where they provided the benefits Allan Savory talks about or were they fed GMO grain in a crowded feedlot? If meat is to be healthy, consumers need to demand that it meets certain criteria. Jessica Campbell is a certified Nutritional Therapy Practitioner (NTP) and founder of the Food Foundation, a Bay Area-based consulting firm that helps people eat healthy. Personal experience and work with clients over the years has taught her to look at alternative therapies and take a more holistic approach to nutrition. “My new love of beef stems from the fact that I made a poor choice in college to become a vegetarian and was that way for nine years. In my recent blog Nutrition and Mental Health I explain how depressed I was from the lack of protein and B vitamins and it was not until I had trouble getting pregnant that I realized how anemic I was,” Campbell said. “I tried many ways to heal, but it was the craving for beef that saved me. I lost two sizes, 10 pounds, and was able to get pregnant after finally reintroducing meat back into my diet. I remember how odd it felt once I finally got pregnant to crave hamburgers all day, but the cravings were there for a reason. When people express their fear of meat, I turn them to the facts. Conventional meat is scary and I understand their fears. These farms have removed cows from their natural diet and fed them GMO corn, soy, and animal wastes, thus they are very sick. In an effort to keep them alive, they are pumped full of antibiotics and hormones to grow faster. We are not sick from eating beef, we are sick from the antibiotics present in the meat, the hormones, and the toxins of GMO feed. A cow is a ruminant, which has four stomachs to eat and ferment grasses into vitamins. Humans only have one stomach so we cannot ferment grass and live off of greens alone. We do, however, have a strong stomach acid designed to access vitamins and minerals from protein. Hence, when we eat beef from cows that have eaten the grasses they were designed for, we access all of the vitamins from their diet of greens. We see more Omega 3 essential fatty acids which are beneficial anti-inflammatory agents and significantly more antioxidants such as vitamin E and beta carotene which protect our cells form oxidation,” Campbell explained. Like ecologists, nutritionists are realizing that it’s not meat that’s harmful; it’s the type of meat and how it’s raised. Cate Ritter is a Certified Nutritionist and Kitchen Coach in Pebble Beach. In her practice, she coaches clients to ask where the meat is coming from and teaches people how to cook meat. “Quality is crucial,” Ritter said. 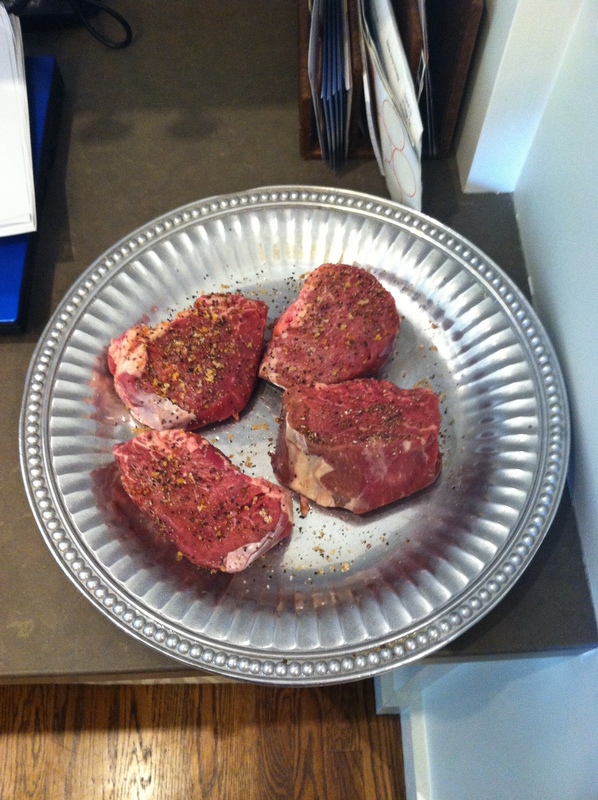 “Unfortunately, some studies linked red meat consumption to an increased risk of heart disease and cancer. But, these studies didn’t distinguish between (1) the quality of meats, (2) the type of meats, or (3) how the meats were cooked. I’m sure most people would agree that a grass-fed steak doesn’t belong in the same category as a processed hot dog filled with preservatives, artificial coloring and added sugars. It’s a slow process, but luckily the health community is finally recognizing the benefits of high quality animal products,” she said. Books such as Nina Teicholz’s The Big Fat Surprise and Dan Barber’s The Third Plate advocate a balanced, more holistic approach to eating & nutrition. They encourage consumers to ask how their food was produced. The wildly popular Paleo diet and CrossFit exercise regimes also encourage pastured meat as part of a nutrient-dense, low-calorie diet to build muscle and immune systems. Decades of doctors’ advice that we should eat a “low fat diet” and stay away from red meat have led to an obesity epidemic in the United States forcing many nutritionists to question traditional guidelines, pushed by powerful interests in the processed food industry. Even former advocates of veganism are seeing the benefit of introducing meat as a nutrient rich food and cattle an essential part of soil fertilization: cow poop grows healthy vegetables. “The flip flopping mostly comes from the media and not nutritional experts, at least not in the holistic field. The reason I love the holistic approach is that we are not researching and developing new pharmaceutical solutions to your symptoms of disease, we are looking back in time to when our ancestors hunted and ate what was there for them to eat. We are acknowledging the innovations of agriculture and farming but we are turning our back on food processing. In holistic nutrition we look for the root cause of your symptoms and most of it happens from avoiding the foods we were born to eat and substituting in artificial foods as if we could do better than Mother Nature. In my own humble opinion, our ancestors ate bugs and weeds. So the way I see it, we can eat bugs and weeds for nutrition too or eat the animals that eat them for us,” Campbell said. Amy Ellsworth, a Registered Dietician Nurse in Costa Mesa, Calif., has also seen an increase in the awareness of how food is produced among her clients. If the answers meet your criteria, then fire up the grill and enjoy a juicy Rib Eye, knowing with each bite that you are nourishing your body and fighting climate change at the same time.